Note: This review contains spoilers. Although these relate to historical facts (since the main character is a real person), I realize most viewers won’t know about them and therefore may be “spoiled” by some of what is revealed below. People love inspirational movies; that’s why there are so many of them. The majority fall into the “based on a true story” category – viewers relate better to historical protagonists, even if their tales have been enhanced/altered to make for a better cinematic experience. Perhaps there’s something inherent in the human DNA that responds to the narrative of an underdog overcoming or maybe the vicarious enjoyment of another’s unlikely triumph is sufficient to cap off the “feel good” experience. 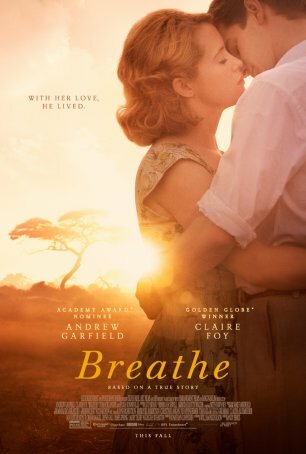 Breathe is one of these films and, like most, it engages in sufficient manipulation to play the right emotional chords. Marking the directorial debut of Andy Serkis, it’s competently made but not exceptional. While not raising to the level of Oscar bait, it nevertheless offers a palatable two hours for anyone who appreciates this kind of chronicle. The historical record tells us that Robin Cavendish (Andrew Garfield), who died in 1994 at the age of 64, was one of the longest-living responauts (those who rely on a mechanical ventilator to breathe) in the U.K. The movie opens in 1957 with a brief account of the courtship of Cavendish (who was not yet disabled) and his wife, Diana (Claire Foy). Because this isn’t the focus of the movie, it is rushed through, which may be a mistake. Ultimately, the bond of love and affection between Robin and Diana becomes crucial to the narrative; spending more time developing the foundation might have paid dividends. The perspective of Serkis and screenwriter William Nicholson seems to be: dispose of the prologue as expeditiously as possible and get to the tragedy. In 1958, as Robin and Claire are expecting their first child while residing in Kenya, Robin is stricken with polio. Paralyzed from the neck down and unable to breathe without mechanical assistance, he is given three months to live. Claire has him transported back to England where he is placed in a specialty hospital. Claire’s unwillingness to give up on Robin enables him to fight through a period of depression and, against doctor’s advice, he leaves the hospital for home. An inventor friend, Teddy Hall (Hugh Bonneville), devises a portable respirator and movable chair and Robin begins to enjoy life again, despite his limitations. He reads the paper every day, spends time with his son, Jonathan (Dean-Charles Chapman), and eventually becomes an advocate for the disabled. Breathe is a straightforward biography that recounts the high points of Robin’s life. For reasons that probably have something to do with not making the actors wear too much old-age makeup, Robin’s death is advanced from the real-life date of 1994 to the fictional one of 1981. The acting is solid but not up to Oscar caliber. Andrew Garfield apparently studied quadriplegics in order to craft a believable performance and it shows. In some ways, the most interesting character in Breathe is Diana – the lovely young woman who gave up her life to care for the man she loved. (I felt similarly about Alicia Vikander’s role in The Danish Girl.) It’s Diana’s devotion, passion, and drive that keeps Robin alive and mobile. Unfortunately, the screenplay never pulls back the curtain to let us see the private struggles she may have endured. Claire Foy is excellent at portraying the devoted, loving wife but isn’t given an opportunity (at least until late in the film) to show more. The rest of the cast is comprised primarily of British character actors. Diana Rigg has a memorable cameo but she’s on-screen for such a short time that if a viewer takes a bathroom break at the wrong time, he/she will miss it. In an indication of how small the British acting community is, many of the cast members of Breathe have appeared in Doctor Who and/or Game of Thrones. Two other films with similar topics come to mind: The Theory of Everything (a biography of Stephen Hawking) and The Sea Inside (about a paralyzed man committed to ending his own life). Both are deeper and more powerful than Breathe because they eschew the straightforward, vanilla approach embraced by this film. There’s nothing wrong with this method of storytelling but it rarely results in greatness. Its intention is to convey information rather than provide a narrative that is thematically rich and thought-provoking. Breathe has moments of emotional resonance but the overall experience feels flat and familiar.